There are plenty of things to see and do in Singapore, whether it’s the breathtaking views from the Infinity Pool at Marina Bay Sands, or the quiet charm and beautiful flora at the Singapore Botanic Gardens. But what if you wanted to do something with a purpose? Although Singapore is a tiny nation, Singaporeans have big hearts. Plenty of people here spend their free time volunteering their time and services to those in need because what better way is there to give back to the community? Whether you’re a student looking for extra credit, a stay-at-home mum with time to spare, or even someone who moved to Singapore recently and wants to meet new people, here are some organisations in Singapore that you can volunteer at. Singapore is known as a food paradise, so it’s is no surprise that food wastage is always being generated. Sometimes excess food — even untouched and unspoiled food — is thrown away without much thought. This discovery led an Austrian expat couple living in Singapore — Henry and Christine Laimer — to create Food From The Heart. This non-profit charity organisation feeds the less fortunate and hungry through a food distribution programme. Volunteers can help by collecting and delivering food to and from various locations or help during the many events they have to raise community awareness. They have even started collecting old toys to collate and distribute to less fortunate children in Singapore. 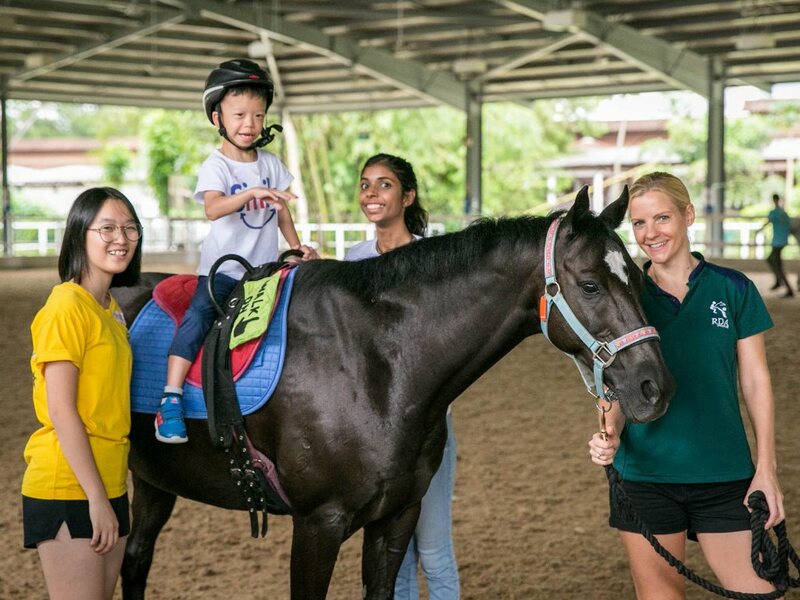 Riding For The Disabled Association of Singapore (RDA) is the only provider of horse-riding therapy in Singapore. It helps people with physical disabilities like cerebral palsy and muscular dystrophy, or intellectual disabilities such as Down’s Syndrome and autism, through hippotherapy, otherwise known as horse-riding. Hippotherapy is proven to be an effective treatment and can really benefit the disabled, as the special bond between horse and rider can have uplifting effects. If you love animals, horses in particular, and want to help the disabled, RDA is the perfect place for you to spend some time. You won’t have to worry about having any prior experience — basic training and instructions will be taught, and you will learn how to guide and work with horses and riders. Not many things in this world are better than seeing a child smile, and the Make A Wish Foundation aims to do just that. Originally started in the United States, Make A Wish now operates in 40 other countries worldwide, and one of them is Make A Wish Singapore. With just nine staff in the office, Make A Wish Singapore relies on their volunteers to help them grant wishes and raise funds for terminally-ill children in Singapore. They work tirelessly to bring hope and happiness to children who suffer from painful afflictions every day, and the goal is simple: to grant the wish of sick children so that they will feel happiness, and more importantly, hope and resolve to fight and live on. If you want to do your part to help a needy child experience all that life has to offer and be a light in their darkness, give them a call today. Do you believe in second chances? The Yellow Ribbon Project (YRP) does, by helping ex-prison offenders be accepted back into society. Many of these men and women have served their time and just want to contribute to working society now, but in Singapore, this may be a bit difficult as there is a certain stigma attached to ex-offenders. YRP helps ex-offenders by organising activities to raise awareness, such as the Yellow Ribbon Prison Run. Volunteers can help to assist with the preparation and execution of the event or join as a Yellow Ribbon Community Project volunteer (YRCP), where you will make home visits to ex-offenders and speak with them and their families. Additionally, if you are an employer, simply registering an account with YRP’s online job portal can help ex-offenders find jobs if you decide to hire. For all the animal lovers out there, listen up! There are plenty of animal shelters and services that always need volunteers — to bathe the animals, clean the living areas, walk the dogs and exercise them, to name a few. There are many animal shelters in Singapore so below we’ll list some of the more prominent ones. The Society for the Prevention of Cruelty to Animals, otherwise known as the SPCA, has many unaffiliated branches around the world, and there’s one in Singapore too. This non-profit animal welfare organisation is the biggest in Singapore, and they receive more 400 unwanted pets or abandoned animals every year. Register to be an animal shelter helper or even man the booth at the SPCA merchandise shop. Are you a cat lover? Singapore’s very own Cat Welfare Society is constantly on the lookout to help these furry felines, and they could always use more help. Register as a Community Cat Caregiver and you can ensure your neighbourhood cats are all safe and being taken care of. If you’re more of a dog person, give Action for Singapore Dogs a look. This non-profit organisation needs volunteers to help care for all the abandoned and abused dogs brought to them, and there’s more than just doggy care — you can help to spread publicity, raise funds, and even learn how to sterilize dogs.